We first encountered petite stuffed bagels at a trade show, some 10 years ago. Made by a Canadian company, they were a delight for the eyes. They were not the traditional two halves of a bagel with cream cheese, but a dome shape with cream cheese piped inside. They tasted the same as a traditional bagel and cream cheese, with a bonus: the dome was more tender, less laboriously chewy than a New York-style bagel. Sold frozen, we waited for them to come to the U.S. Alas, they never did. In 2014, Bantam Bagels opened up a shop in Greenwich Village, selling the same idea freshly baked. It expanded to a nationally-distributed frozen business. A couple of years ago, Nancy’s Petite Stuffed Bagels debuted, also frozen. 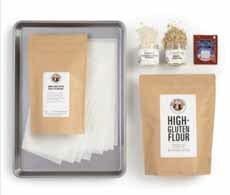 Now, King Arthur Flour has teamed with Milk Bar pastry chef Christina Tosi to create a kit version of her Bagel Bombs. 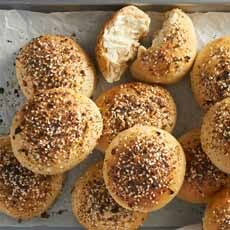 King Arthur Flour calls them Stuffed Bagel Buns. The dome bagels in the kit are stuffed with a cheddar and cream cheese filling and sprinkled with everything bagel topping. The kit is $48.65; you can order it here. You can check out the recipe for free. 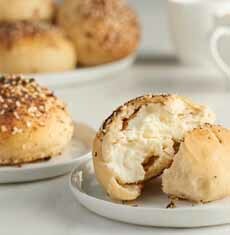 King Arthur Flour’s “Stuffed Bagel Buns,” available in a baking kit (photos courtesy King Arthur Flour).